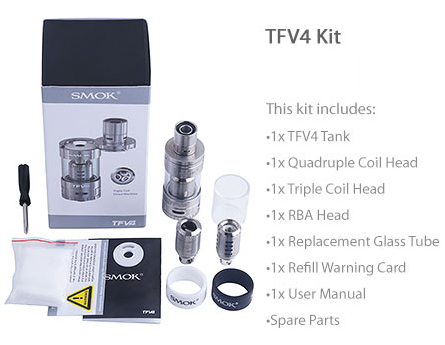 Smok TFV4 Tank is a game changer sub ohm tank and is taking the SubOhm Tank world by storm. Smok TFV4 Tank features patented unique sub-ohm coil heads which will give you a true cloud chasing experience out of a sub ohm tank. Genuine Product from Smoktech. This is cloud machine bound to impress serious cloud chasers. It has triple coil head that can fire all 3 sub-ohm coils. Please ensure you have enough grunt in battery to fire this fantastic tank. The taste furious SMOK TFV4 tank from SMOK features new patented Quadruple Coil Head, Triple Coil Head and RBA Head, which will bring you a true premium experience. The top refill unique design makes filling as easy as it gets.